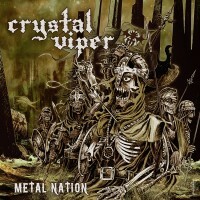 CRYSTAL VIPER released their second full-length in 2009 under the title “Metal Nation”. Like their debut, “The Curse Of Crystal Viper” (2007, see the review of the re-release here), this was re-released (with bonus tracks, extended booklet and all lyrics) in July 2012 via AFM Records. No intro here, I wrote most in the other reviews already. “The Curse Of Crystal Viper” also has an intro (“Breaking The Curse”), this one filled with symphonic and acoustic elements. The title track follows with hymnic guitar melodies that flow over into uptempo, fast verses which are clearly METAL! The chorus remains a part where catchiness dominates; midtempo first, then raging fast. Solos round off the song. Quality assured! “Bringer Of The Light” begins in IRON MAIDEN fashion, similar to their hit “Aces High”, connecting with Heavy/Power Metal verses. Marta’s clean vocals have an aggressive edge that fits well here. The song sounds like IRON MAIDEN, only with more power. There’s also lots of room for solos. “1428” is another melodic, MAIDEN-like song. It begins in a melodic way, not too fast and the veeres off GAMMA RAY-style. Double bass is key, though not in a fast manner. It’s the musical rhythm that makes it all attractive. What the song is about, I don’t know. I’m sure a lot happened in 1428, but I can’t make out what Marta is singing about. The old school Heavy Metal influence remains imprinted, even in “The Anvil Of Hate”, which becomes a Power Metal song after the intro. Having a fast and energetic track at this stage is just wonderful. Plus, the song is very good as well. Off to war then in “Zombie Lust (Flesh Eaters)” which has a similar intro like “One” from METALLICA. Only, this one here has zombies too, spooky. Powerful Metal kicks in then, going into full speed shortly after. The guitars shred out the Metal and the chorus reminded me of (old) NOSTRADAMEUS and (old) EDGUY. While the music is again super, the vocals are not. It’s as if Marta was too enthusiastic during the recordings. Nothing wrong with that, but you can hear it doesn’t flow so well with the music. Time for a resting point then with “Her Crimson Tears”, a power ballad. Piano guides Marta, who obviously can’t sing as vigorously as before and this clearly shows her accent and throat limits (a bit hoarse). The music is good, though. “Legions Of Truth” is one of those songs that get you energized (again). Power and fury! Double bass Power Metal! Shredding guitars! And last, a very catchy melodic chorus! Great stuff, as if that wasn’t obvious. 😉 The normal tracklist has the AGENT STEEL cover as last song, but the promo of this re-release set it a track earlier. Still, a good effort by Marta and co. Last there is “Gladiator: Die By The Blade”, which consists of 3 parts. Somehow, while this is a good song, it reminded me a lot of MANOWAR’s “Blood Of My Enemies” in terms of rhythm, pace and feel. But it’s good. The bonus tracks then, 6 in total. “Axeman’s Revenge (live intro 2008-2011)” is the orchestral intro the band has been using the past few years for their gigs. It’s good. “Metal Nation (karaoke version)” is the instrumental version of the title track. I always like that, think bands should add such bonus tracks more often, as it allows to focus on the music and not worry that there will be singing. Sometimes you want to hear certain things better, but when there’s singing it’s not possible to do so. “The Banshee (2011 version)” is a re-recording of the ballad, very MANOWAR-like. It’s got vocals, piano leading and organ in the back. “The Anvil Of Hate (demo version 2007)” is as it says, the demo version of this song. Sounds good, a little more rough. Another instrumental track now, with “Bringer Of The Light (karaoke version)”. Convenient if you want to sing along. And the RUNNING WILD cover “Libertalia” is well done, although I’m not familiar with the original. It’s a midtempo Metal song, but speeds up in the chorus. “Metal Nation” is an album on which CRYSTAL VIPER opts for a more Power Metal-influenced direction, whereas on their ebut and following albums the focus lies more on (old school) Heavy Metal. Either way, the band delivers again on Their second album. I have to say I really like what the Polish did here. Lots of catchy powerful tunes. If you’re into (old) HELLOWEEN, GAMMA RAY, FREEDOM CALL, STORMWARRIOR and so on, then by all means, add “Metal Nation” to your collection.